We Can Help With Your Cleaning Needs! Dirty Cows have pioneered the ‘Gift Package Clean’ and crafted a unique selection of gift cleans for a range of celebrations and special occasions. Taking away the chore of cleaning makes a unique and thoughtful gift for friends and relatives, or even yourself. Give someone a well-deserved treat on a certain special occasion. From Father’s Day to Mother’s Day, New Babies, Weddings and all the parties in between, we have gift cleaning packages for a range of celebrations and special occasions, browse our four different categories to find the right one for you. A personal cleaning consultation, where you will be invited to be as fussy and particular about the details of your clean as you fancy. Your consultation will be booked in and carried out prior to the chosen cleaning date and will take place with the recipient at the property in question. An individually tailored cleaning programme that meets precisely with your cleaning requirements and specified selected cleaning products and solutions for precious and delicate surfaces. A specified number of hours of careful and attentive cleaning carried out by our professional package cleaning teams, who are of course all; fully employed, professionally trained, comprehensively insured, extensively vetted and who have earned their elevated position and outstanding reputation as a member of our specialist package cleaning teams. All quality cleaning products and equipment is included and it would be our pleasure to cater for an eco friendly clean should this be your wish. The choice and use of our delectable selection of seasonal ‘Jo Malone’ and ‘The White Company’ room scents and living colognes. If you are a regular package cleaning customer we like to make a note of your favourites. Your chosen gift clean certificate and note card for your personal message housed in our trademark black and white cow-print gift box, lined with scented tissue paper and hand tied with gross-grain ribbon. And to finish off every package clean, a complimentary beautiful hand-tied bouquet of seasonal flowers crafted by our favourite florist. Your gift package clean includes recorded delivery (via Royal Mail ) to your address or you can choose for your package clean to be sent directly to the recipient of your gift. Please allow up to 48 hours for delivery for all weekday orders. All of our package cleans are carried out by a minimum of two Dirty Cows exceptional package cleaners, depending on the size and detail of your home and they will complete the clean in half the amount of hours stated on each gift certificate, taking up less of your valuable time. Additional hours can be purchased at a discounted set hourly rate of £25 per hour plus VAT, per pair of package cleaners. This can be arranged and discussed during your package clean consultation should this be required. All gift cleaning certificates are valid for 12 months and must be booked in prior to their expiry date. All instructions on how your recipient can book in their gift clean can be found on the reverse of the gift certificate. Please note that our package cleans are very popular and if the recipient of the purchased clean desires a specific date for their clean to take place then booking in and planning ahead early is absolutely essential. Please allow a minimum of 6 weeks notice to avoid disappointment for specific dates. The perfect gift for new home owners or busy families who move frequently. Let us take pressure off your move by cleaning your new abode top to toe. At Dirty Cows we appreciate that it is not always possible to have a free day or too after exchanging contracts and prior to moving in so that our team can clean an empty house, so working around you and your boxes is something that our teams are adept at. We recommend planning ahead and booking your ‘ New Home Clean’ for 2 to 7 days after moving in if cleaning prior to move day is not possible. 8 cleaning hours carried out in one visit. The Dirty Cows Recuperation Clean is a truly thoughtful gift for a friend or loved one who is recovering from an illness or operation and could use some help with their housework and cleaning tasks whilst they recover. The clean provides a gift cleaning routine of 3 hours per week for four weeks following an illness or operation. Return home from your holiday to clean beds and a lovely fresh and organised home. The Dirty Cows holiday clean is a staple favourite amongst our clients. An ideal gift for expectant parents preparing for a new arrival. This is our Dirty Cows No. 1 best seller for corporate gifts , with businesses wishing to treat a colleague who is leaving work to have baby. If you would like us to drop your colleagues a hint, do email us their contact info and we will make a polite suggestion. This is the perfect gift for new parents as its provides a much appreciated cleaning gift routine of 3 hours per week for 6 weeks following the birth of baby/babies. This gift is very popular with our new mums requiring a Caesarean section delivery and certainly helps make the early weeks with a newborn a little less challenging. 18 cleaning hours carried out in 4 to 6 separate visits. A fantastic birthday present for a friend or loved one who would love our Dirty Cows cleaning team to help get their home clean, tidy and organised. 8 cleaning hours carried out one visit. Makes a great gift for land mark wedding anniversary and is very popular amongst our more senior clients who would like Dirty Cows to get to the hard work areas of their homes. A staple favourite ! Treating your Mum to a unique and thoughtful gift that takes the hard work out of her usual routine at a busy spring cleaning time of year is always gratefully received. It may be a novel idea to purchase bespoke cleaning package for your dad and he may not be immediately overly enthused by the idea, but once our team have completed the job your dad will be asking for them to visit again. Dad’s who have received a ‘Dirty Cows Father’s Day Clean’ are one of our largest growing groups of clients requesting our ‘Quarterly Spring Cleaning’ service, so we know it is greatly appreciated. We know its not quite Bvlgari or a weekend on the Amalfi Coast but treating your lover to a Dirty Cows Valentines clean shows a modern, forward thinking ingenuity that has a lasting feel good factor at a very busy Spring cleaning time of year. We are a ‘Brides Magazine’ favourite! Our Dirty Cows Honeymoon clean is the perfect final flourish wedding gift ! Our newlyweds love looking forward to returning from their honeymoon to a beautifully clean and organised home. A pre-wedding cleaning consultation with the recipients is essential and early booking of honeymoon cleaning date to ensure the desired dates are available, a must. This package is a corporate favourite for business team collection gifts! If you would like us to drop your colleagues a hint do email us their contact info and we will make a polite suggestion! ‘Tis’ the season for parties and fabulous gift giving at Rosa Cleaning Services. 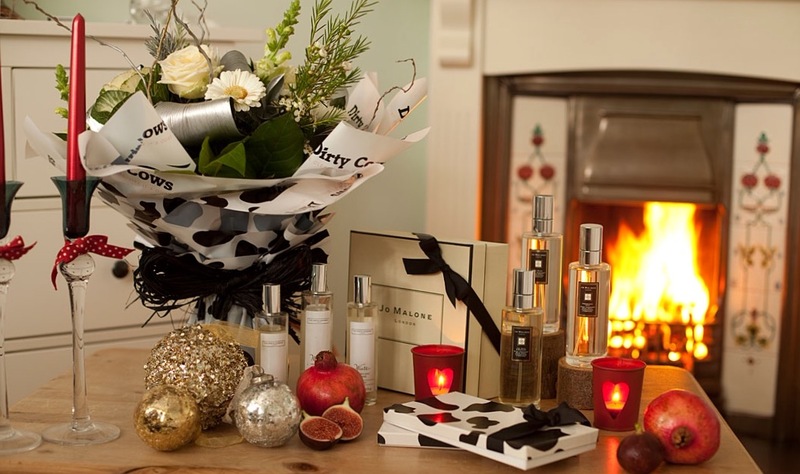 We have been busy selecting the finest winter blooms for our hand tied bouquets and this year’s most decadent living colognes by Jo Malone and The White Company, all to complement our bespoke gift cleaning packages that make the ideal Christmas gift for the fussiest of recipients. 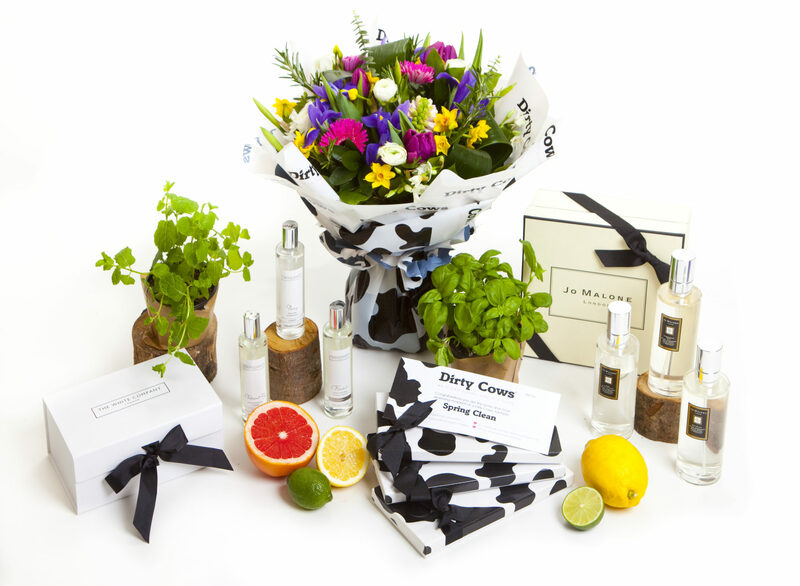 The most popular Christmas gift cleaning package is the ‘Dirty Cows Spring Clean’ which includes: a Spring Clean gift certificate and gift card, housed in the Dirty Cows trademark black and white cow-print gift box, lined with scented tissue paper, and hand tied with ribbon. The recipient of your gift will be able to book their cleaning consultation prior to their clean and at a time convenient to them, where they will be invited to be as fussy and particular about how they would like their cleaning hours facilitated, with a bespoke cleaning schedule being tailored to their precise requests. Following this, the clean will be booked in and carried out by our supremely professional and courteous package cleaning teams, with exceptional quality cleaning products and equipment included. The final flourish of every gift clean is a beautiful hand tied bouquet of flowers and use of this seasons collection of luxury living colognes. 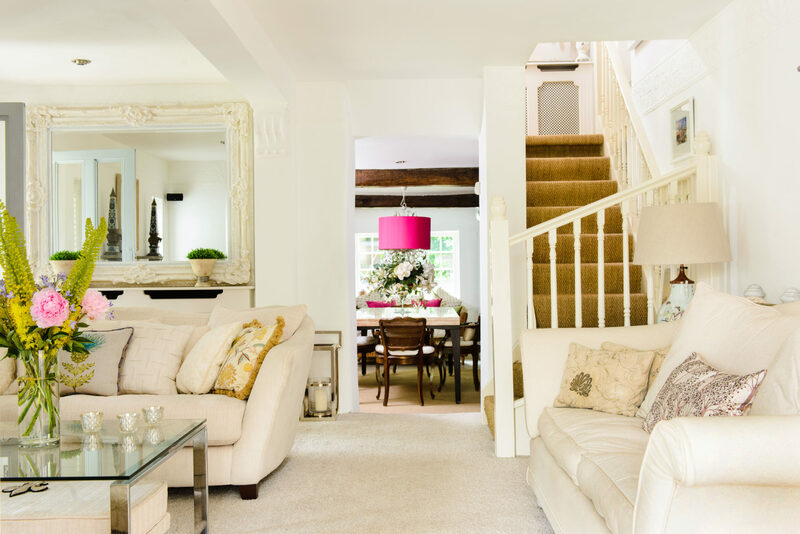 Our clients tell us that their Spring Clean was the most unique and thoughtful Christmas gift they received and as soon as the tree is down and the New Year is in they are on the phone to book in their clean. All of our people are trained to have the utmost respect for your home and your privacy and any sensitive data or paperwork that may be present in your home or work places. Our company polices relating to the protection of your privacy, confidentiality of corporate and personal information are strict and numerous and adhered to by all staff. These are important reassurances for our high profile clients where confidentially and press intrusion is an extremely important factor. Our service comes with a customer care guarantee. Our fully trained insured professionals are monitored to meet expectations agreed by our booking team or money back guarantee.